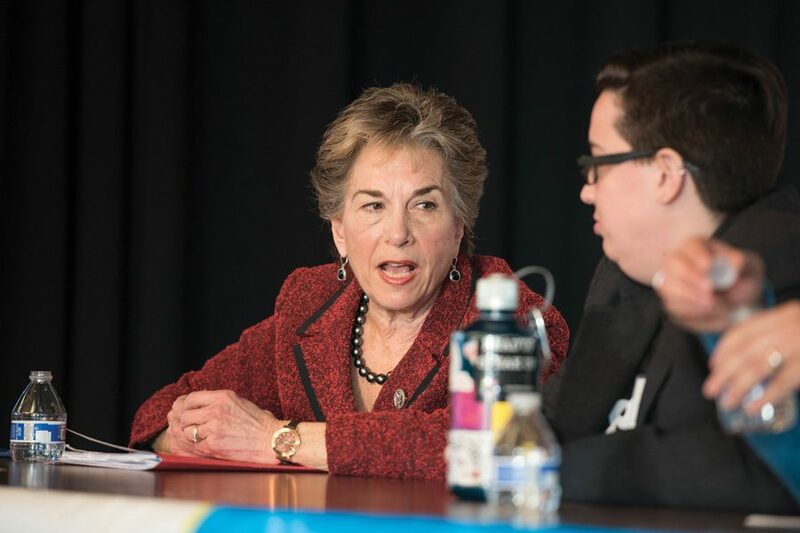 U.S. Rep. Jan Schakowsky (D-Ill.) speaks at an Open Communities event in February. Schakowsky joined other Illinois politicians in criticizing President Donald Trump’s rollback of birth control coverage. Illinois Democrats rebuked President Donald Trump’s decision to roll back a birth control mandate issued by the Obama administration, calling the move an “attack” on women’s health. In a Friday statement, U.S. Rep. Jan Schakowsky (D-Ill.) called birth control an “essential” part of women’s lives. She said the move would allow employers to stand in the way of women’s health care. The Affordable Care Act mandate, signed into law seven years ago by former President Barack Obama, requires that birth control be covered as a preventive service with no copay — meaning health insurance companies will often fund the entire cost. Trump’s move will likely impact millions of American women who currently receive contraceptives for free under this provision. U.S. Sen. Tammy Duckworth (D-Ill.) called the move a transparent and “utterly shameless” attack on American women’s access to affordable health care in a Saturday tweet. She added that reproductive rights are not the only benefits at stake. “Limiting access to (birth control) doesn’t just limit women’s reproductive rights — it limits health care options for medical conditions like endometriosis,” Duckworth said. Biss also went a step further, saying that Trump’s move emphasized the importance of state and federal universal health care. “Somber days like these underscore the importance of fighting for our values here in Illinois and ground me in the need to fight for universal healthcare at the state and federal levels,” Biss said.